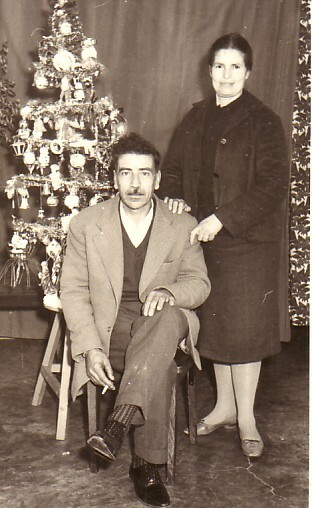 Above: My parents, Christos and Maria. Above Right: With childhood friends, Theodoros Kamaros, myself, Efstratios Taranis and grigorios Kamaros (squatting). Above: With friends and family. With friends and family: my cousins, Mihalis and Georgios Panagis, Mihail Vetsikas, Efstratios Taranis and myself. Above Right: National Service, 1961.I was in the heavy artillery. Above: My son, Christo, with my father, Christo, during one of his holidays to Greece. Above Right: My daughter, Maria, with my parents, Christos and Maria, during one of her holidays in Greece.